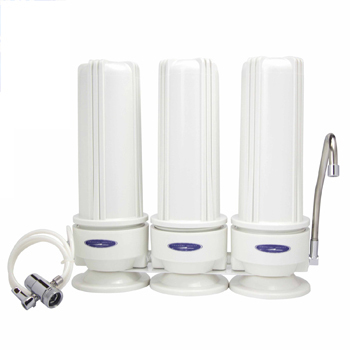 Fluoride Removal Countertop Filter Triple by Crystal Quest is a 3-cartridge system with 8 stages of filtration. It consists of one fluoride removal cartridge for more contact with water and better reduction, a carbon block cartridge and the standard multi-stage(6-stage) cartridge. Fluoride filter cartridge reduces fluoride below 0.5 ppm using a Fluoride Removal resin containing Synthetic Aluminum Oxide adsorbant media specifically designed to have a high affinity for Fluoride, Lead and Arsenic. 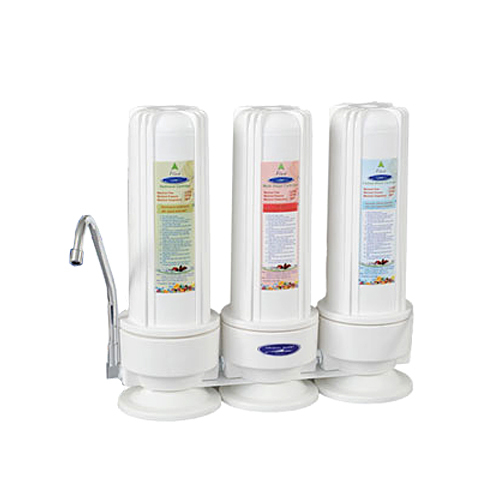 Carbon Block filter reduces chlorine, chloramines, and Volatile Organic Compounds(VOCs). One multi-stage cartridge with the added combination of Granulated Activated Carbon(GAC) and Eagle Redox Alloy media that increases the systems' effectivity in removing hundreds of other contaminants from your tap water. 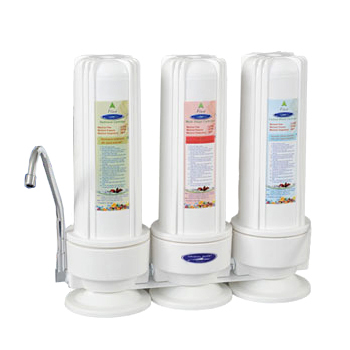 Countertop water filter systems installs in seconds and sits on the countertop for water on demand. 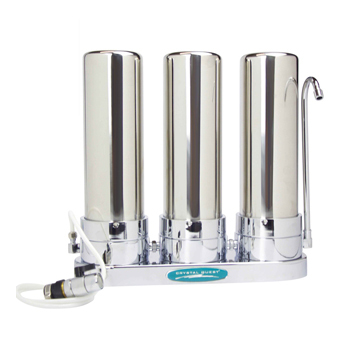 This compact, triple cartridge system is your best option for fluoride removal and other contaminants from your drinking water. Fluoride is commonly known to be used on dental products. It is a naturally occurring element which is present in water and soil at varying levels. Municipal water treatment plants commonly add fluoride to the water for prevention of tooth decay and maintain a regulated concentration for safety. Today, fluoride has found its way to our homes in more ways you can imagine. From dental products to food, beverages, medicines and even utensils that cause an increase of fluoride content in food. Fluoride may cause health problems if present in public or private water supplies in amounts greater than the drinking water standard set by EPA. According to the EPA, exposure to excessive consumption of fluoride over a lifetime may lead to increased likelihood of bone fractures in adults, and may result in effects on bone - leading to pain and tenderness. With all these, the last thing you want is fluoride in your water. Fluoride Removal filter also effectively removes lead and arsenic. Carbon block filter reduces VOC's. Combined with advanced GAC and KDF media technology. - High pH and high bicarbonate levels reduce capacity - above 100 ppm bicarbonate, reduction by 50%; above 200 ppm, reduction by 75%. - Recommended flow rate for best fluoride removal: 0.5 gpm. - Available in white or chrome finish. Great customer service here. It was a little difficult setting up, but they sent all the right "parts". I have leakage and spraying here and there and I have to "adjust" that every few days, but other than that, it is now working fine. Water tastes good, and the unit is nice. Overall: a good system.